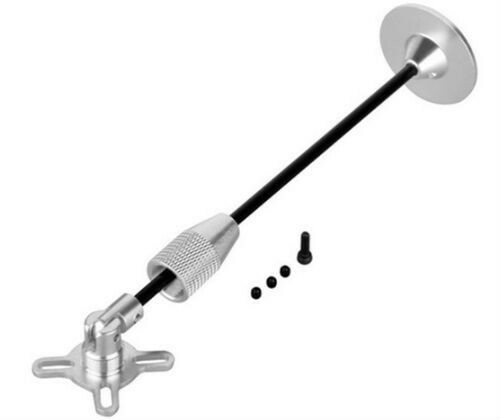 This GPS Foldable Antenna Base With Carbon Rod is suitable with DJI's GPS units, the carbon rod allows the GPS / compass system to be laid down to aid with transportation. The base fits over the frame arm holes of a F550 or F450 Flame wheel and it only weighs 9g's with the shaft.. This replacement GPS mount can be used for the Wookong M and Naza V1, Naza Lite and Naza V2 GPS units, the carbon rod provided 9.5 cm of clearence to stop interference with the compass. I bought this for my F450 with a Naza V2. It works very well and has prevented any worries about breaking the antenna rod during transport. The only problem I found was that when the locking collar was screwed all the way down it did not hold the antenna completely rigidly so there was a small amount of vibration present in flight. This was easily fixed by adding a rubber washer on the carbon rod under the locking collar. I don't know if the vibration would have made a difference in practice to the GPS performance but I didn't want to take the chance. I bought this for use on my F550 to protect the GPS antenna during transport. It is brilliant and a recommended purchase if you are buying the GPS unit with a NAZA or similar flight controller. The mounting base aligns with the 4 mounting screws on the F550 arms - use slightly longer screws than normal (plenty in the F550 kit) so no need to use a sticky pad on the base. You will need one for the GPS antenna and as It does not come with sticky pads you will need to use some of the spares that come with the original kit. It is important that the grub screws are flush with the lower fitting to avoid the head fouling the locking collar - a little work with a file on the carbon rod flat may be needed. The grub screws need to be tight, you will need a 1.2mm AF hex driver for them. Use thread locking compound when you are satisfied with the fit, you don't want the screws coming out in flight. If you are replacing an existing unit, don't forget to adjust the mounting parameters in the firmware! I bought this item as I have been worried about breaking the OEM part on my F450 with Naza V2 during transport. The item is slightly heavier which is to be expected but the rod is longer which I can only see as a good thing holding the GPS compas further away from the electronics on the quad, the length is not an issue as it folds flat. I have found that where I mount my battery on top of my quad I have angled the hinge in such a way so that when folded down the velcro strap holds it still. The only critisism I have is that it would be nice to include a replacement sticky pad to re-mount the GPS compas to the top mounting plate as when removed from the OEM part the origional does not have all its stick. As always delivery was like lightning and ordered and paid with ease.